Occasion: Ramadan Total servings: 3-4. Best for: All Preperation time: Half An Hour. Potato And Spring Onion Bhaji recipe by Sajida. 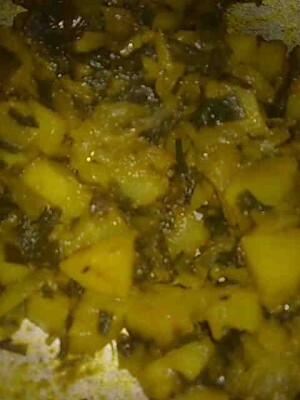 at DesiRecipes.com. Small new Potatoes 1/2 kg. Spring Onions(finely chopped) 12 bunch. Red chilly powder 1/2 tsp. Wash the potatoes well and cut them in two pieces. While washing most of the loose skin will come off so you don't have to peel them. Fry onion and red chillies to light golden brown. Add the salt , whole coriander, turmeric powder and red chilly powder. Fry for a little while with some water. Add the potatoes. Cover and let it cook on a slow fire stirring occasionally. When the potatoes are tender, fry for a few minutes more and serve hot as side dish.